The paperwork’s all in, it’s been approved by a very professional and courteous democratic services department at Thanet District Council and I am officially both the Green Party’s parliamentary candidate for North Thanet, and one of the Green Party’s candidates for Margate Central ward in the TDC elections held on the same day. Now the battle begins in earnest. I started writing a list of things I hold important and that I am campaigning on, which grew ever longer and I realised I could probably go on all day. (Some of them are below, if you’re interested!) But I appreciate even if elected I would have limited power to do anything other than advocate and fight for my constituents. So here are three simple promises that I believe I could keep if elected. 2: The WWF estimates that the equivalent to 36 football fields of forest are bulldozed down globally every minute. 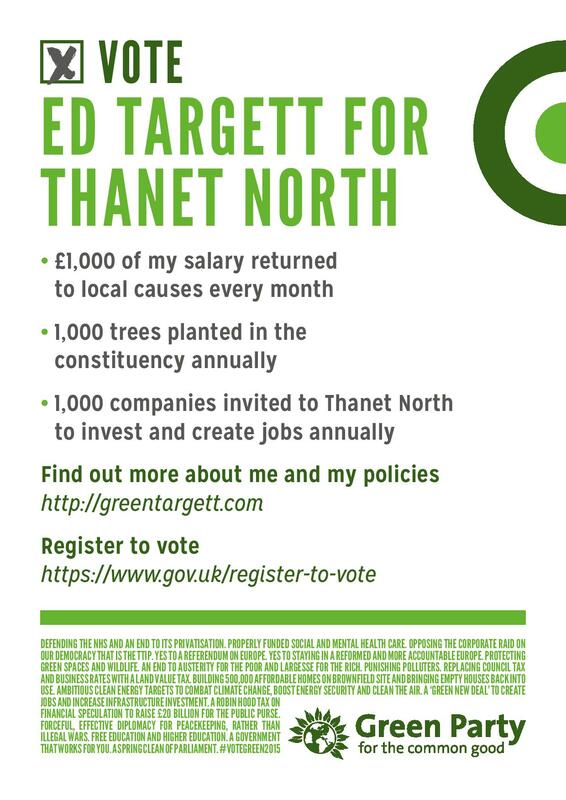 So I promise to try my utmost to plant 1,000 trees across the North Thanet constituency every year if elected. 3: Good jobs in North Thanet are in desperately short supply. I promise to write to 1,000 companies nationally and globally (as many as possible in the sustainability sector) every year inviting them to the constituency to relocate or invest here. Simple promises that for the sake of an MP working for you, for the sake of wildlife and biodiversity and good jobs and inward investment I can make and believe I can keep – and hopefully good for the constituency irrespective of party politics. I have posters/leaflets available: Let me know if you can deliver some or want some yourself. My contact details are here. Many thanks to all who have supported me so far! There’s the simple stuff. Some more thoughts on what I believe in and why I think it’s important: 1) Climate change is a genuine threat to humanity. I’m not going to argue with the U.S. Defense Department (not on this one) NASA, nor the august list of institutions here. Even if you insist on holding a contrary position on this, I would argue that most measures to combat climate change, from renewable energy to moves to decarbonise the transport sector in the long run are going to benefit us all, via cleaner air and more efficient transport. There is an urgent task ahead of us and here in the UK we have the capabilities to be leading the way—and developing capabilities, expertise and technologies we can gain first mover advantage on as well; good for the economy. 2) There have been five past great mass extinctions during the history of Earth. There is an ever-growing belief within the scientific community that we are facing a sixth mass extinction; for which human activities are associated directly or indirectly with nearly every aspect. Reversing this is something of an urgent task. It’s easy not to notice when obscure lifeforms you probably wouldn’t notice in your daily life start disappearing, but disappearing many of them are, with (in the UK) critters from bees to hedgehogs under attack at our habitat-destroying hands. And to that I would just say it’s time to learn about the birds and the bees again. Literally. We need to start looking after our environment more. 3) Our economy needs some radical revisions. Unconventional monetary policy has frothed up equity markets, left hedge funds and traders loaded with ‘liquidity’ (so-called because in this instance it is the blood of the public sector) and everyone else faces cuts, cuts, cuts. Even the Bank of International Settlements acknowledges that “Main Street” is getting screwed to serve “Wall Street”. One hugely experienced economist and former hedge fund portfolio manager I work with admits that the government might as well just write everyone in the UK a cheque for £5,000; the principle is the same and the latter would probably have a better effect. Let’s turn the situation around with a higher percentage of GDP dedicated to actual investment in useful infrastructure and the real economy, with proper funding for schools, with the creation of secure blue collar jobs, intensive R&D in exciting renewable energy innovations and other aspects of the engineering ingenuity for which Britain used to be renowned. Let’s make whopping multinational companies pay their bloody tax too. 4) Let’s bring the railways back into public ownership. Is it right that the vast majority of UK rail franchises are owned by state-backed European operators? Yet the government has been desperate to privatise the public franchises here that were actually returning money to the Treasury? In contrast to the government’s stated opposition to public ownership of our railways and its commitment to competition, this research reveals that they have no opposition to state ownership of our railways when it is by other governments. Foreign state-owned rail companies are using profits earned through operating franchises in the UK to keep fares down and ensure rail services are better in their respective countries. That via ever increasing passenger fares and taxpayer subsidies in the UK! I could keep going: Why are we still dependent on coal and gas for 60-70% of our electricity generation? Why are we generously subsidising Chinese and French state-backed companies to build an “economically insane” nuclear power station, with stupendously expensive electricity prices locked in for decades, when renewables costs are falling so fast and power generated by renewables in the long term actually drives down wholesale electricity prices?